The LG Series “Little Giant” is the first lightweight- heavy duty reel on the market. 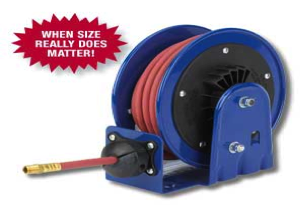 This little giant can accept either a 1-4” or 3/8” hose to tackle the jobs of reels almost doubled its size. The LG is perfect for commercial or industrial applications where space or budget is limited. It is extremely lightweight and compact and can install almost anywhere. The auto rewind conveniently wraps and stores the hose while protecting it. This reel is specially designed for tubing with no corners to pinch the tubing, or rollers that the tubing can be caught between.